Mid Summer Update In the Garden, There’s Lots of Vegetables Growing! 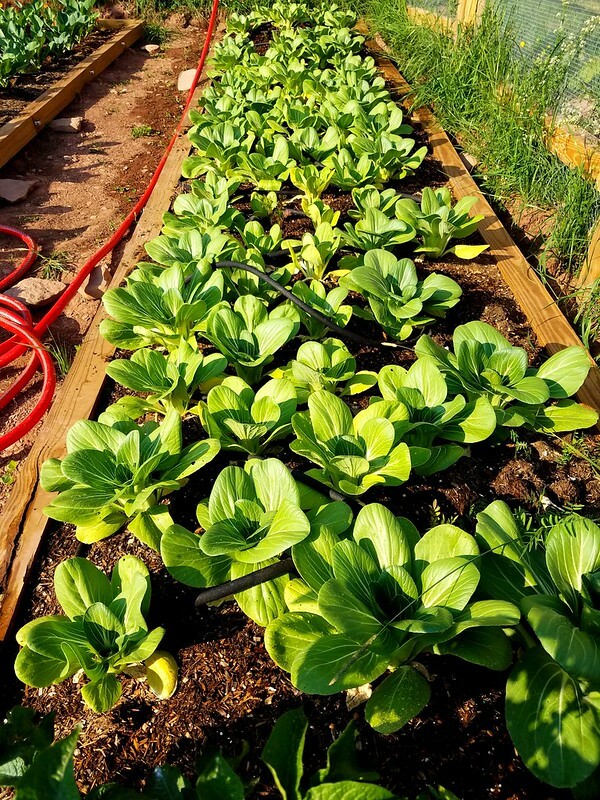 July 9 Weekend Harvest – Sugar Snap Peas, Bok Choy, Lettuce, Kale, Collards! 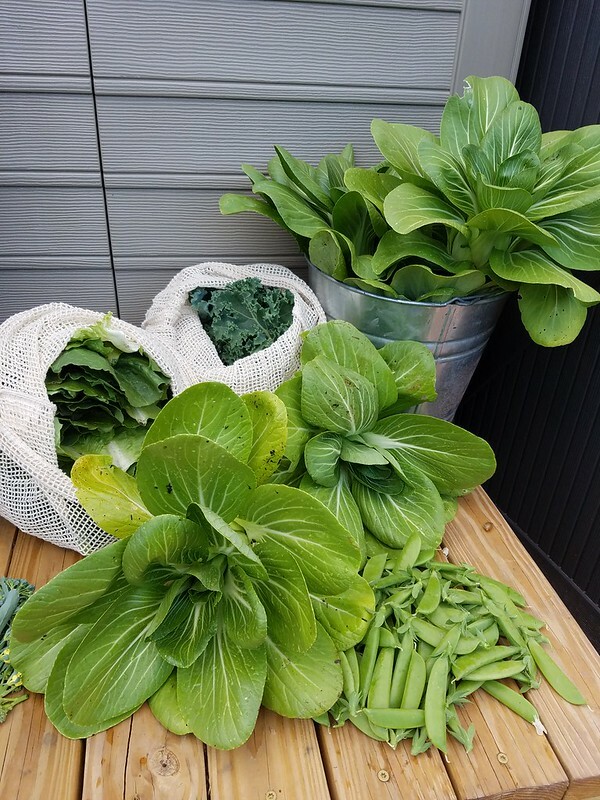 July 2 Weekend Harvest – Sugar Snap Peas, Bok Choy, Lettuce, Kale, Collards! Spring seeds are planted! Come cheer them on! 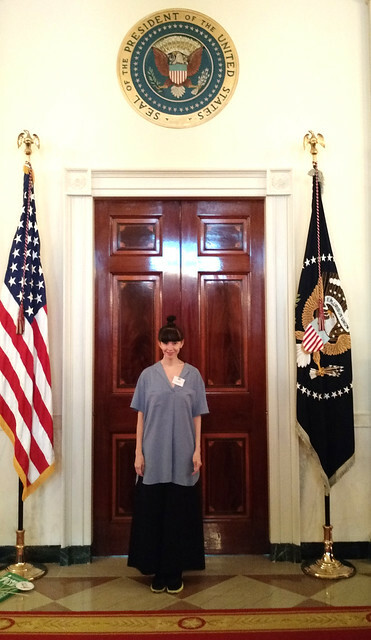 A Visit to the White House Garden – Full Tour of Veggies, Bees and More! 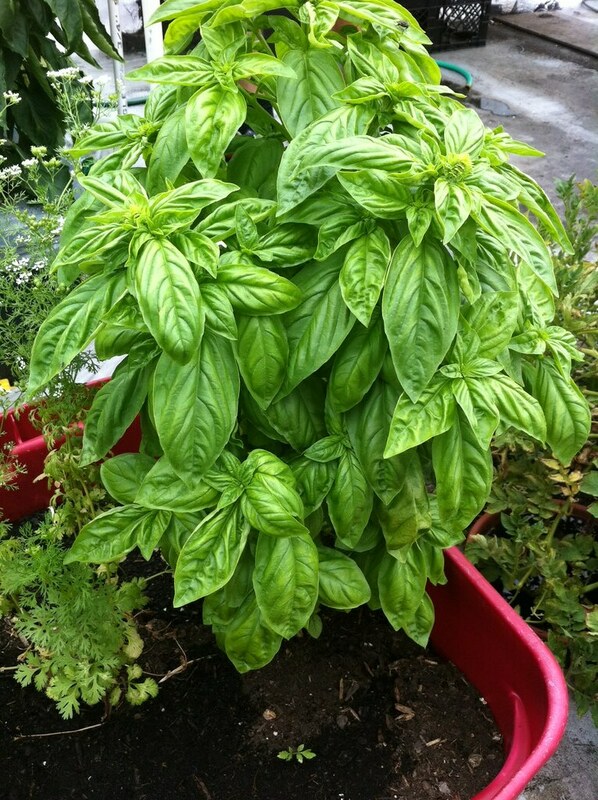 Garden Update: What’s Growing in November? Hold on to your sunhats because this is going to be a long, picture heavy post. It takes lots of visuals to show what’s growing in the garden! First, the break down. What’s currently growing? Yup, only 2 plants are done so far, the rest are just starting which means we’re in for quite a haul of veggies for the next few months! Welcome to the garden everyone! As you some of you know, this garden was a work of love this year. I’m talking about the entire process. Remember in the Winter when it was 20 degrees and we were Upstate trying to dig through the frozen ground? That’s love. There was a point in the early Spring where we spoke to each other about the possibility of this completely failing. 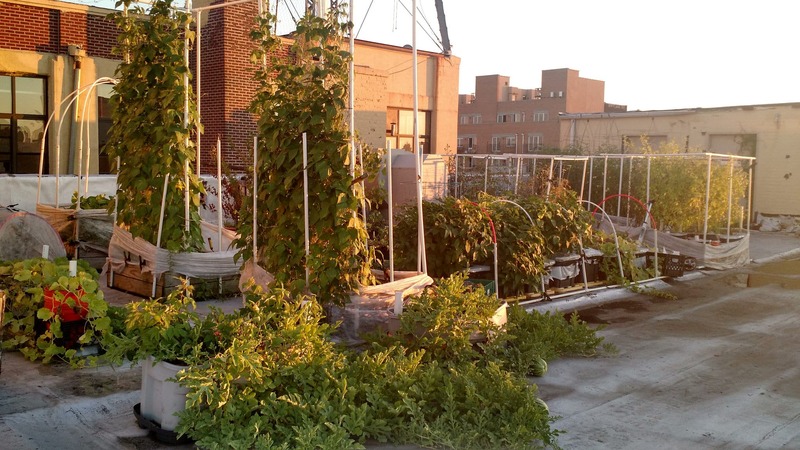 What if we can only grow on rooftops? I’m happy to report that we can grow in the ground! It wasn’t a failure. I had a moment of pure bliss while standing in the garden on Saturday morning, looking around and seeing all green. 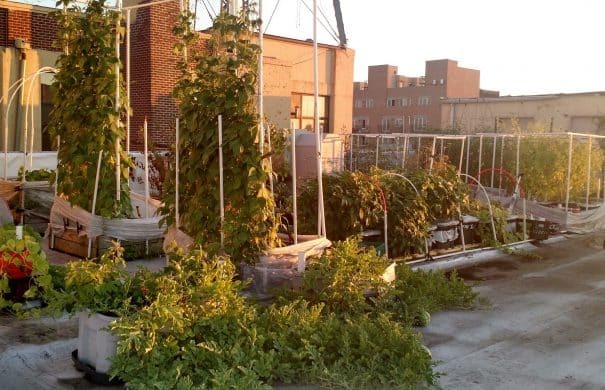 We built this, we grew this, we created this garden together. It’s all for the love of vegetables. Remember just a few months ago this was what the garden looked like? There’s been some ups and downs. 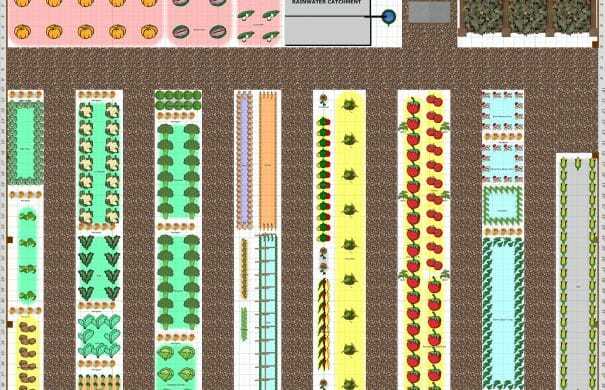 First there was building this massive garden. It was hard work. 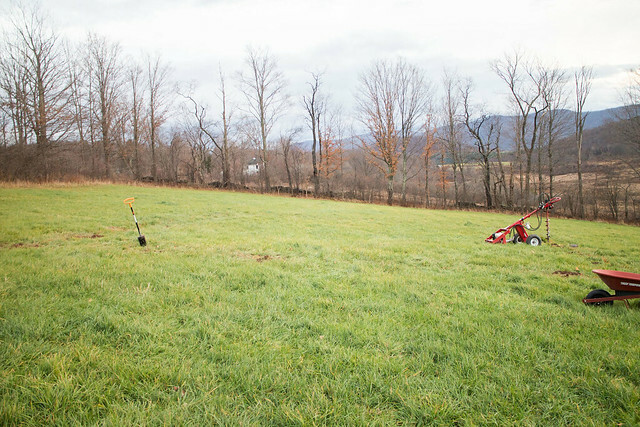 We don’t live Upstate, we live in NYC, so our time spent on the land consists of working, working and working. 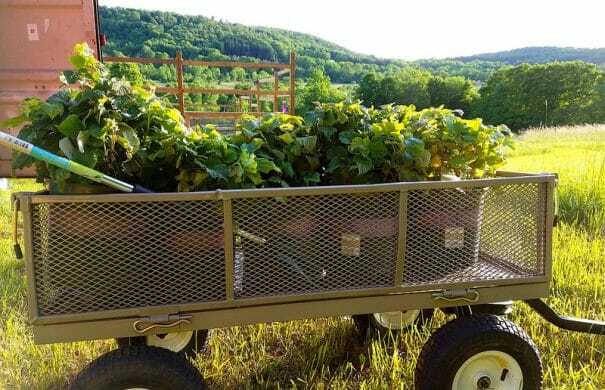 To be honest, we still haven’t had much time to enjoy the land as when we drive up there every weekend, we’re on a mission to get our week’s worth of gardening in one day. Yup, you read that right. 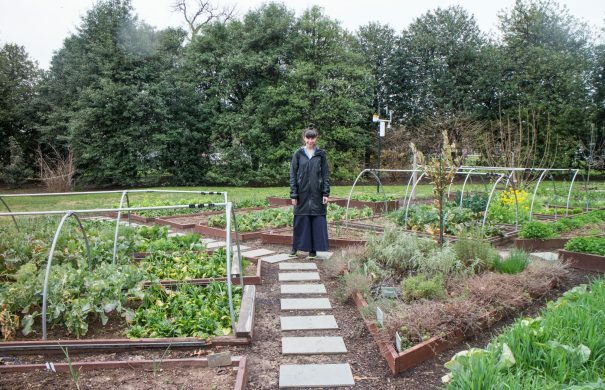 This garden gets taken care of one day a week. That’s why the fence is so crazy, we knew we couldn’t prevent animals from attacking while we aren’t there so we decided to make it tough for them to get in. So far it’s working. 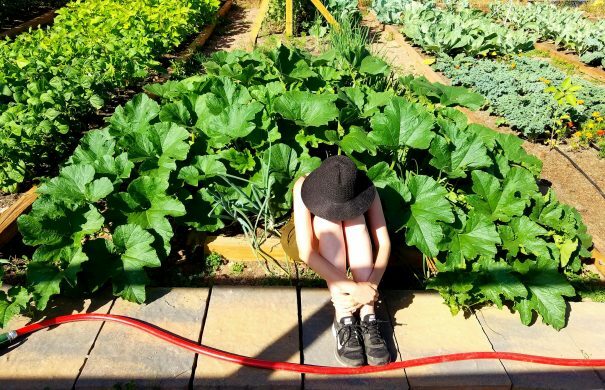 Because we only visit once a week, we rely on good soil filled with nutrients to make sure the plants stay healthy and strong when we’re not there. We got a pH test done in the Winter and the soil was lacking nutrients. The soil was super acidic and had low mineral and organic values. To give you a idea, Phosphorus was “very low”, Potassium was “low”, Calcium was “low” and Magnesium was on the low side of “Optimum”. The soil pH value was 5.6. Yuck. 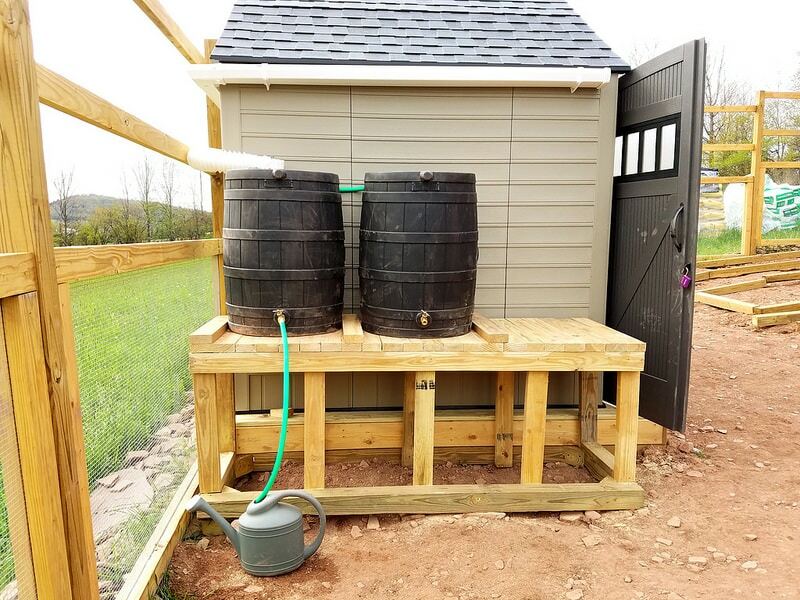 We pray to the weather gods that it rains once or twice a week to keep the plants watered, but if it doesn’t, then we water our hearts out when we visit once a week. 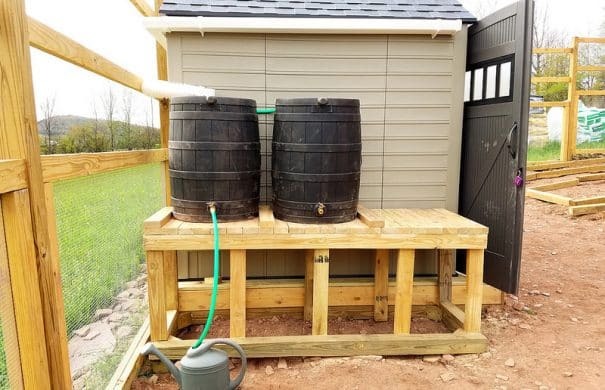 Thankfully because of the soil and nutrients that we added in, the soil stays pretty wet, which means it can take care of itself when Mom and Dad aren’t there. 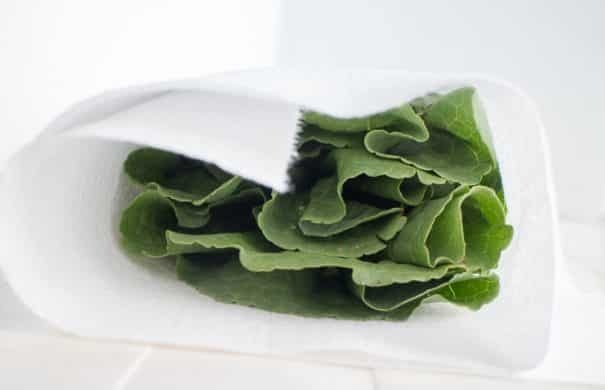 Use paper towels to keep your lettuce leaves and sugar snap peas fresh for weeks. 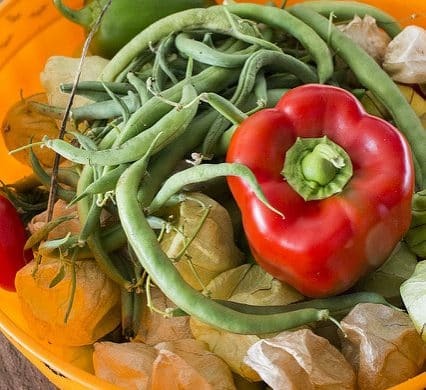 The paper towels help remove moisture that can make your vegetables go bad. Right now we are picking pounds of lettuce and sugar snap peas. Just this weekend we picked 10 pounds (!!) of lettuce and 5 pounds (!!) 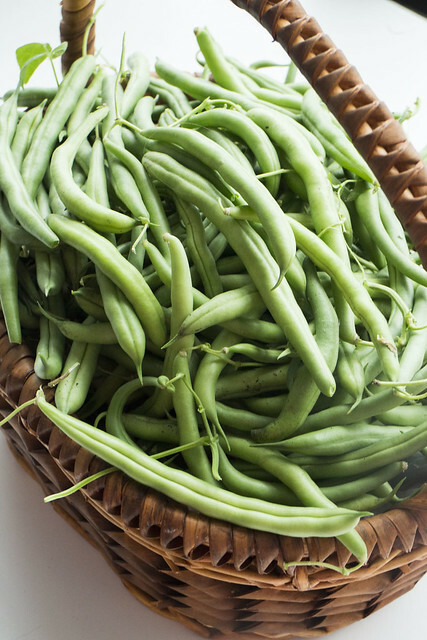 of sugar snap peas. We usually don’t pick this much lettuce at once, but the heat hit and we know it’s going to turn bitter if we keep it in the garden so we’d rather pick it now. 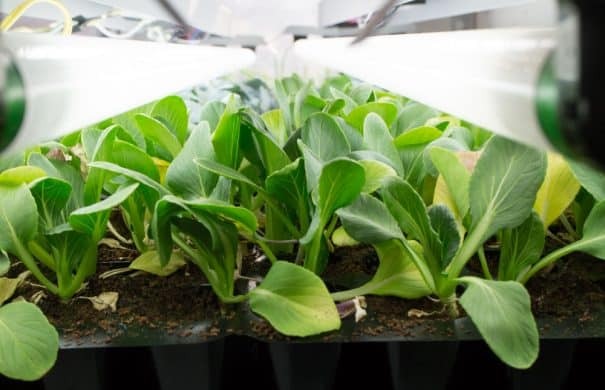 Over the past few years I’ve spent lots of time experimenting trying to keep our vegetables fresh for as long as possible as there’s nothing sadder to a gardener then seeing their plants go to waste. You might have remembered last summer’s tip on how to keep your lettuce fresh for a month with aluminum foil? Yup, works great! 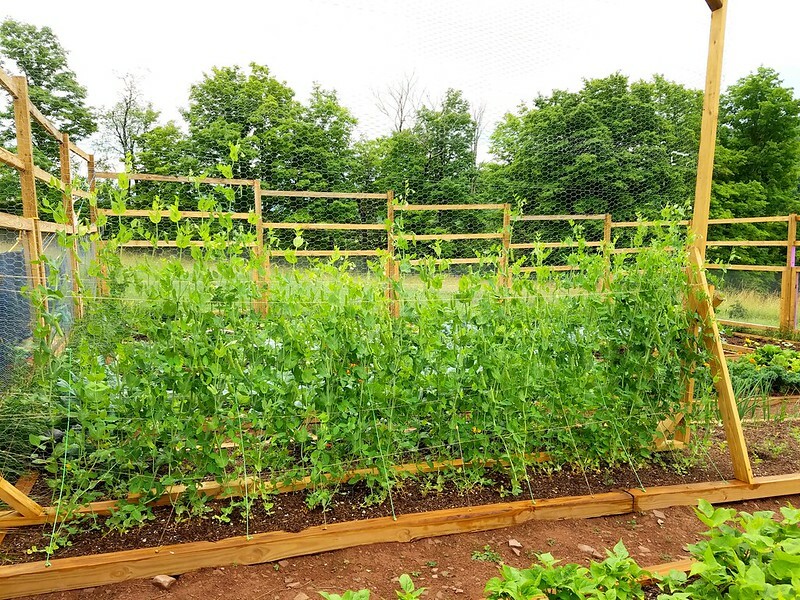 And now I’m back with more fresh tips, this time for lettuce leaves and sugar snap peas. 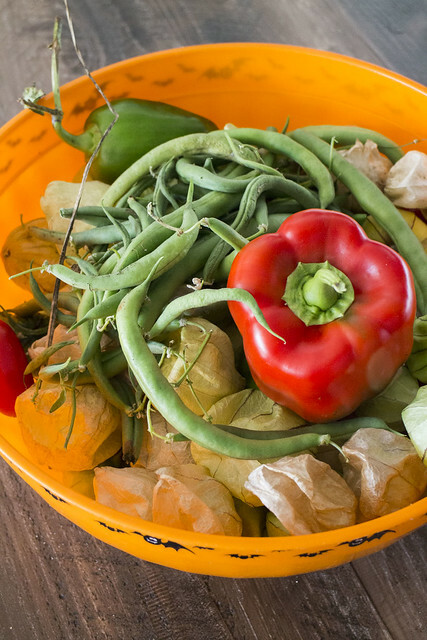 All you need is your vegetables, paper towels and a produce bag. Yup, it’s another harvest post. Yup, we’re picking the same veggies as last week again. This weekend we had off and on rain while visiting the land, with a heavy downpour happening in the late afternoon that followed us back to NYC. I can’t complain about getting wet in the rain though because water is definitely what the garden needs in this stage. 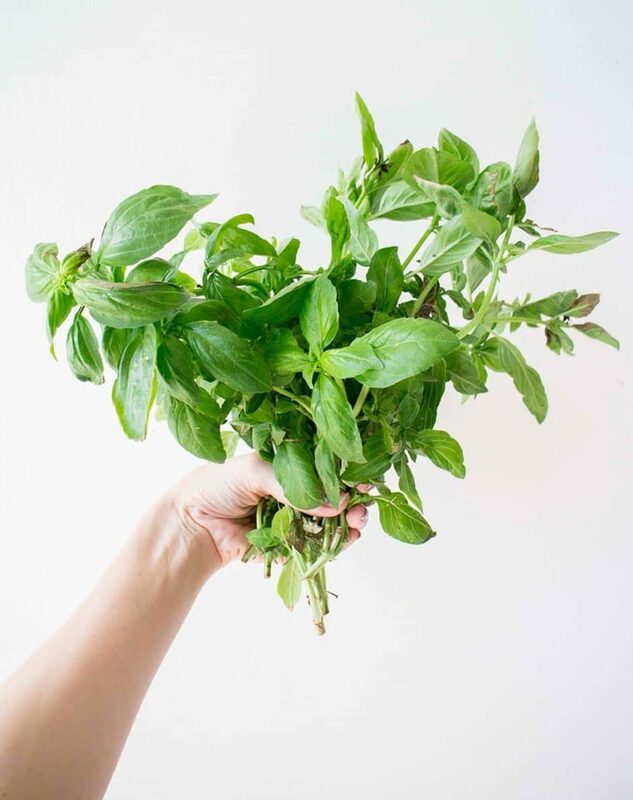 Our refrigerator is filled with greens right now. We have no idea how we’re going to eat that much lettuce. Thankfully I figured out how to preserve lettuce better last year, and now I can freeze all our bok choy. So let’s jump right in, sugar snap peas, bok choy, lettce, kale, collards.. I’m coming for you! 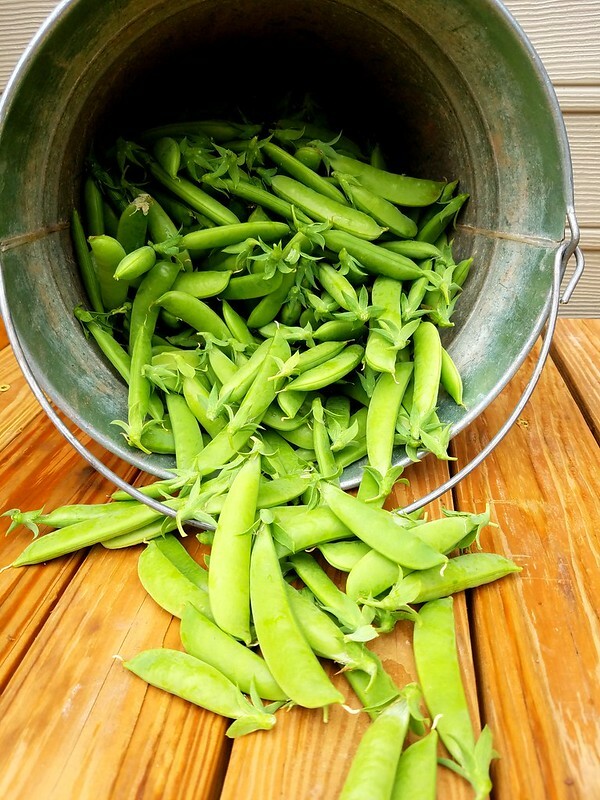 The sugar snap peas are in full growing mode right now, we’re picking them by the bucket. Last weekend we picked over 5 pounds! Did you have a good weekend? The weather was beautiful on the land this weekend, 70 degrees, sunny, and the perfect amount of breeze. It started out chilly enough in the morning that I had to wear a sweatshirt, to the afternoon being able to wear a t-shirt and then at dinner time I needed a sweatshirt again. Saturday had it’s ups and downs for me. I enjoyed gardening, picked lots of vegetables, painted some of the fence (can you guess what color? ), had a cookout with some friends who stopped by. The downs were that I started the morning hitting my head off the car door, and then I found a snake skin (terrified of snakes) where I was sitting, and then I found said snake that was trying to hang out with me (that was not happening) and then I fell near the stream grabbing on to some thorny bushes that need to be cleared on my fall down, cutting up my hand and leg pretty badly. Thankfully we had a first aid kid and Matthew happily covered up my hand heavily in ointment, gauze and bandages. 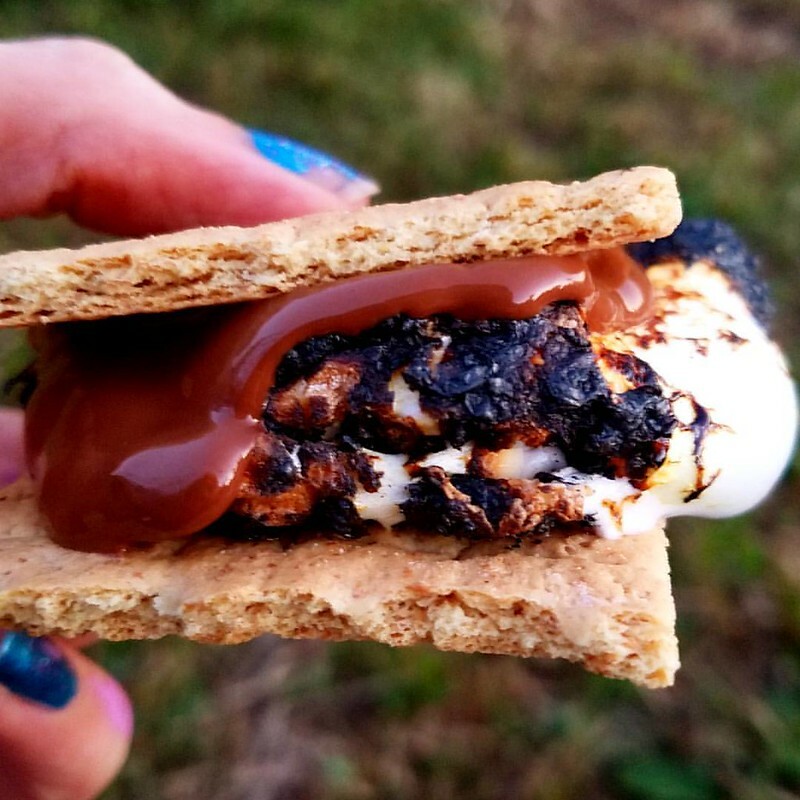 All pain was forgotten when I bit into the campfire made S’more that night. But on to the veggies because that’s what this post is about. 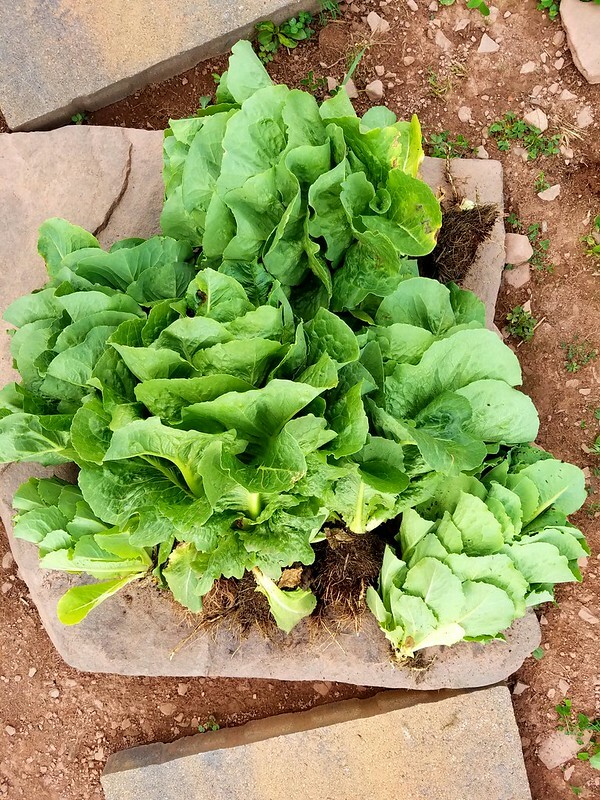 Keeping with the theme of all the greens we picked last week, you’ll see a repeat of many characters – bok choy, lettuce, collards, etc. We’ll be picking these for the next few weeks and I’ll continue to keep googling “What to do with lettuce” because there’s lots of it! The Spring 2016 seeds are planted! 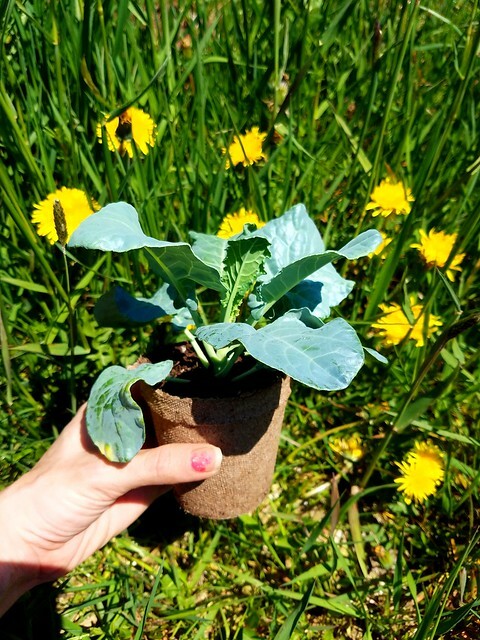 Broccoli, Cauliflower, Brussels Sprouts, Collards, Bok Choy, Cabbage, Kale and Onions seeds are all popping through the soil! Come and cheer them on! 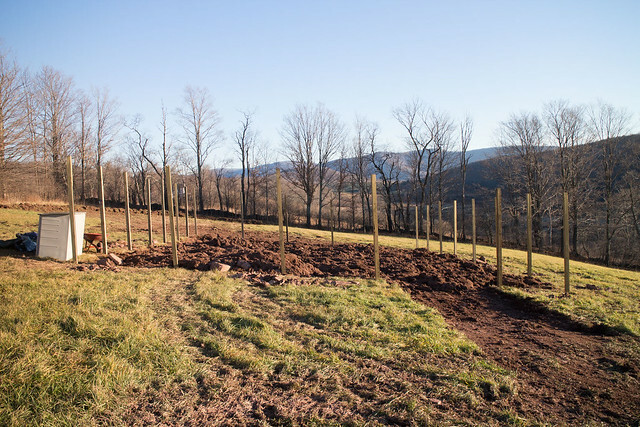 We’ve been busy on the weekends getting the Upstate garden ready. This weekend we put lots of hard work in, and next weekend will be even more harder. The good thing is a day of Upstate work equals a week’s worth of workouts (research done by me). I’m going to have such strong muscles one day. 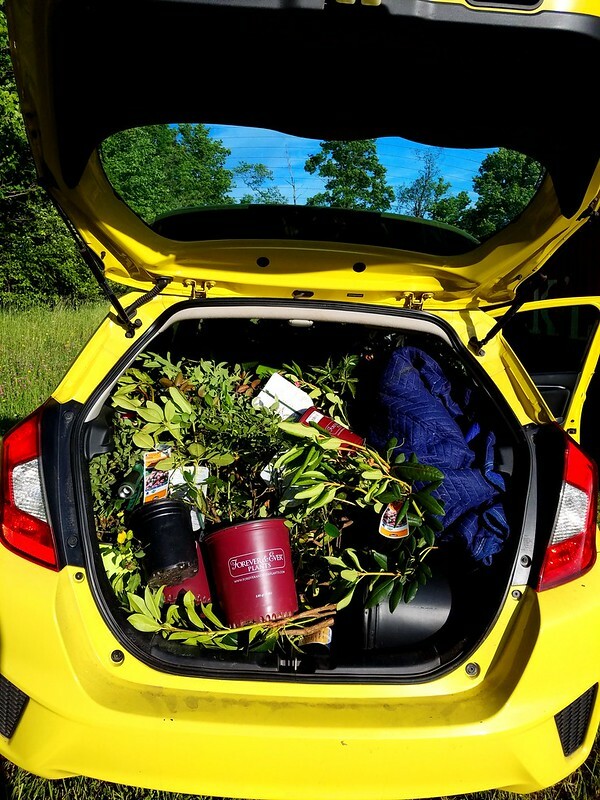 While we’re busy doing manual labor, there’s labor going on here, but the plant kind. The seeds were planted, and they burst through the soil at record speeds. 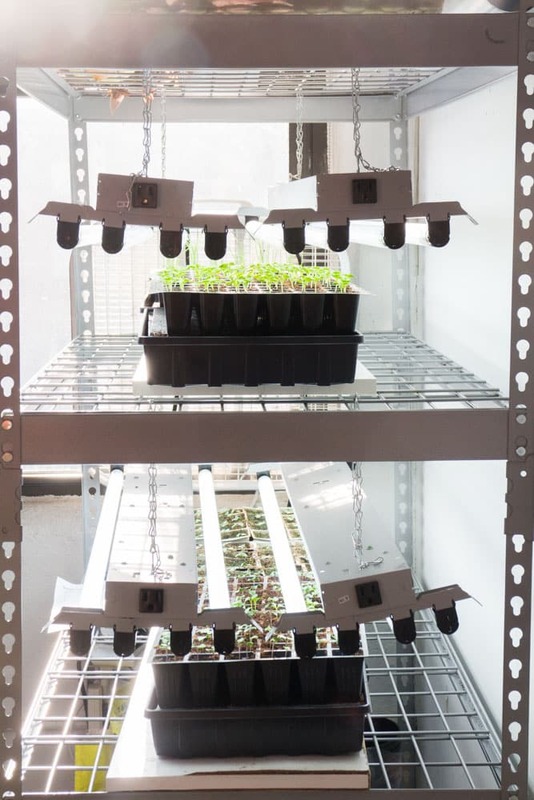 We built a new grow light cart his year (DIY coming soon!) and it’s been majorly effective. In the past we’ve had to wait about a week for our broccoli and bok choy seeds to come up, but this year within 2 days they already broke through the soil and were waving hello. As usual, we planted double seeds in each pot, and as usual every seed came up. It’s always the difficult choice of killing a seedling, or doubling your garden. We have garden parent guilt syndrome (aka GPGS) so we usually can’t kill the extra seedlings. Matthew is like “You cut them” and I’m like “No way! You do it!” and then noone does it. Just today we were planning on getting rid (that sounds awful) of the double plants, but we decided to “hold off”. That means we’ll never do it. We always grow our vegetables from seeds. 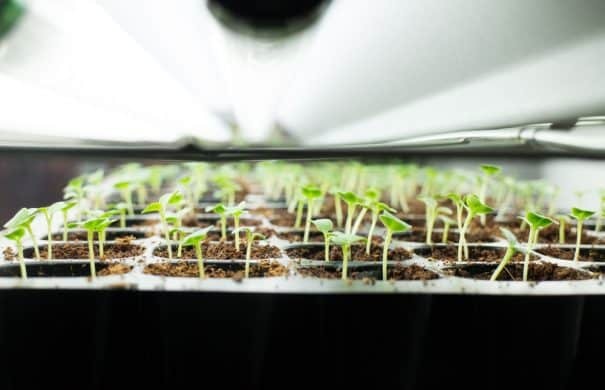 Not only is it worth it to watch them grow from seed to vegetable bearing plant, but it’s much more economical. 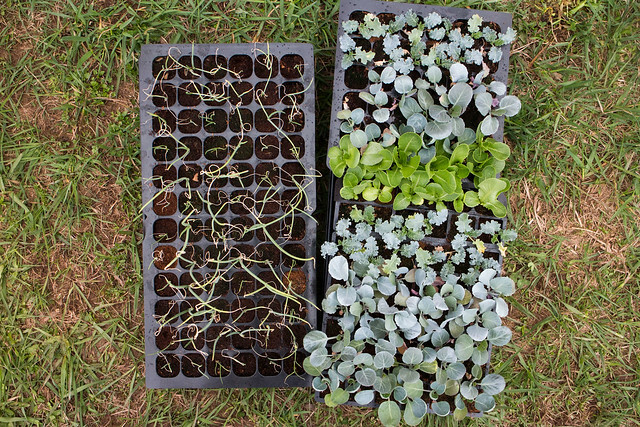 A pack of seeds averages on $2-$5 and that can sometimes get you up to a few hundred plants! 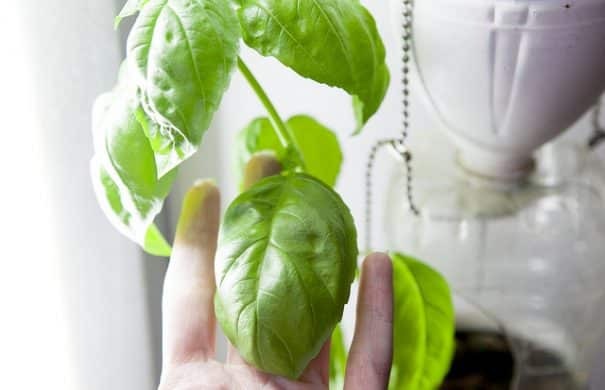 A baby plant at a nursery usually costs a few bucks (if not more with heirloom) and you don’t even know if it’s going to survive, so you can see how much money you save. 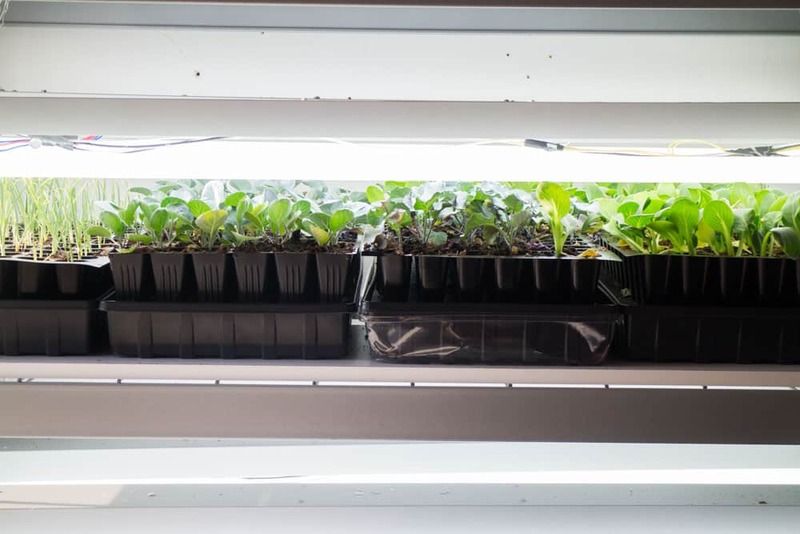 Since we started growing the rooftop garden we’ve learned that it’s important to have good quality seeds, ones with high germination rate and successful growing. 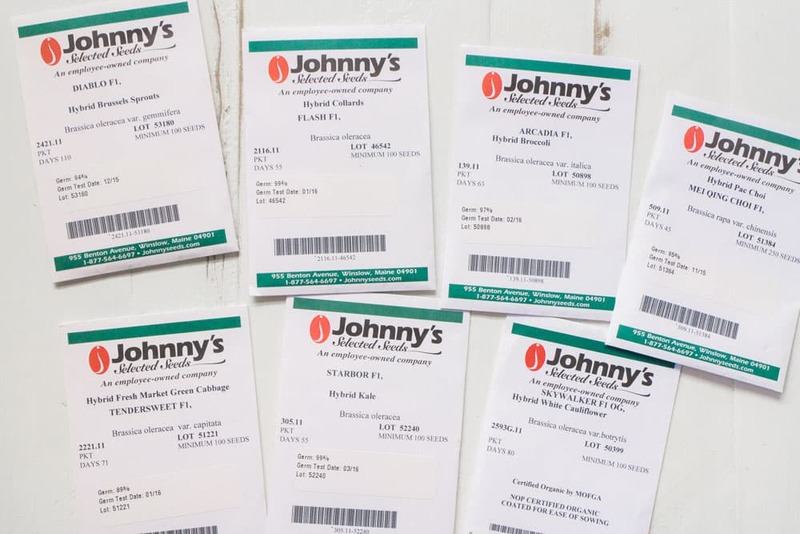 Johnny’s Seeds are our go to seed company. We’ve been buying off them for years and have never been disappointed. 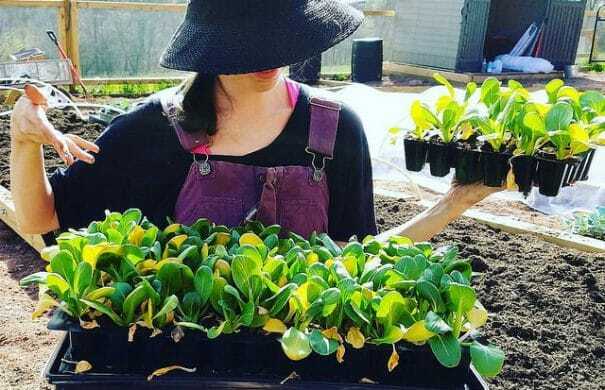 We have a list we usually stick with every year from growing experience, but occasionally we try something new (lots of new pumpkin varieties this Fall!). When you get a email invite to a private event that Michelle Obama and the White House are hosting for Let’s Move, you accept it. Well your heart skips a beat, you accept it and then you try to figure out what shoes you’re going to wear. It goes in order like that. That’s what happened last week. Last week, I made the trip to Washington DC to attend a event to have a conversation on the health of our nation’s children. Let’s Move (started by Michelle Obama in 2010) is a group initiative to encourage healthier food in schools, better food labeling and more physical activity for children. 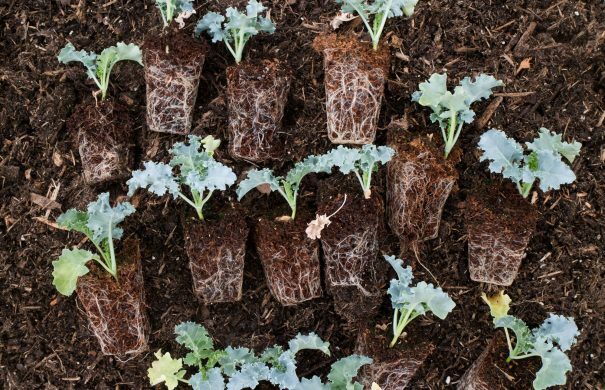 Gardening goes hand in hand with this initiative as it’s important to grow your own. 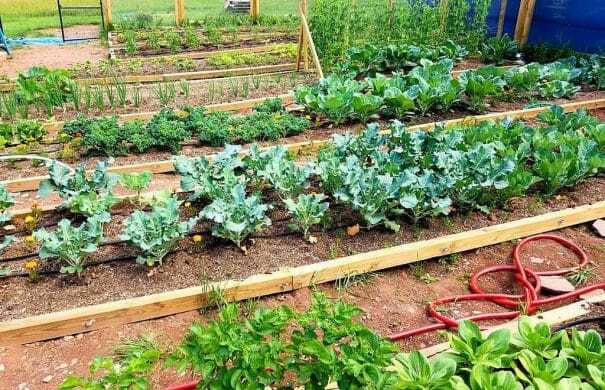 Growing your own vegetables promotes healthy eating, but it also informs you where your food comes from and the process of plant life. 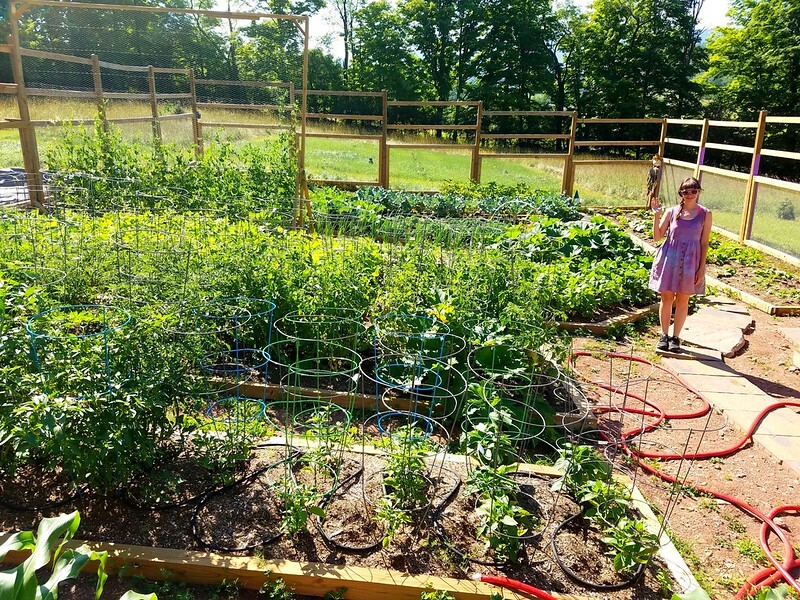 If more families were to start their own gardens, they would eat fresh vegetables more often, along with creating family activities to build/maintain and to learn about gardening. I’d say I was one of the few non parents at the event, but I don’t think you need to be a parent to understand why eating healthy matters and to encourage it. Since we started the garden on the roof years ago my own eating habits have greatly improved. I love vegetables now. Sometimes for dinner I just have vegetables, years ago that would have never happened. With the experience of growing the garden I learned so much about nature and the planting process. If you haven’t planted a little itty bitty seed and watched it grow into a full on broccoli plant, you haven’t lived. 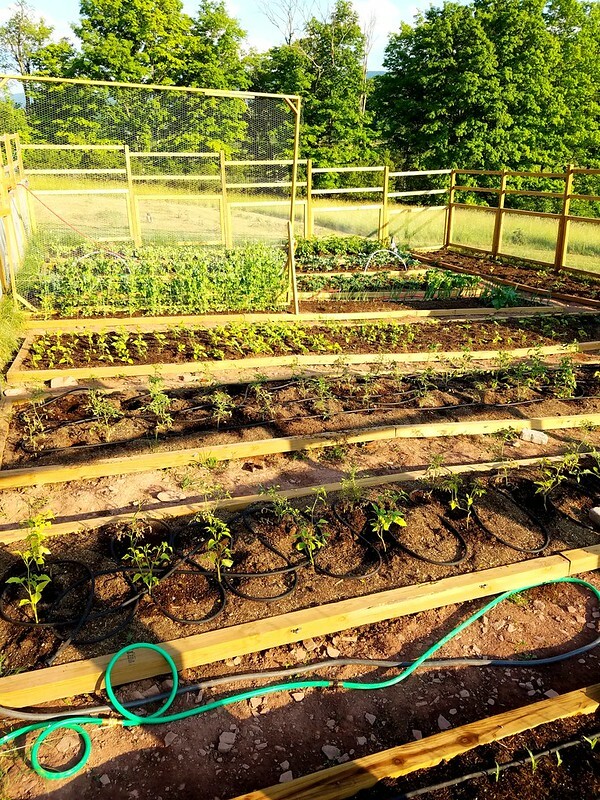 Even at 32 years old, I’m still excited and amazed when I see a few ounces worth of seeds can turn into hundreds of pounds of vegetables. Before having the garden I didn’t even know where so many vegetables came from. I know it was a plant, but I didn’t know what the plant looked like, how long it took to grew, growing conditions and more. 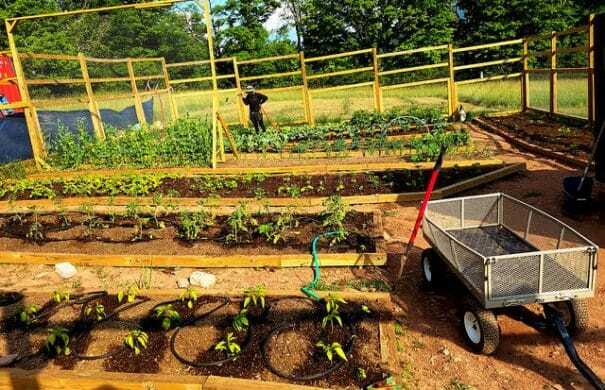 Growing your own makes you respect vegetables a whole lot more. Can I get some respect for vegetables? Amen. And lastly, because of these vegetables I learned how to cook. I almost think it should be a required class in schools now to learn how to cook. If we all cooked at home, think of the impact it would have on obesity, overall health and factory farming. If you follow this blog then you probably already know the joy and satisfaction one gets when presenting a meal to their family that is home cooked. I wish everyone could experience this! 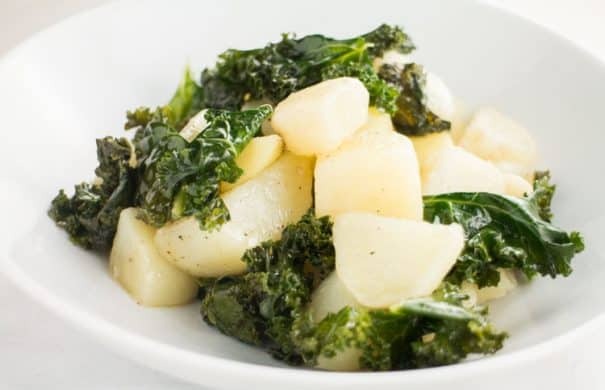 EASY recipe for Potatoes and Kale, my favorite healthy meal. 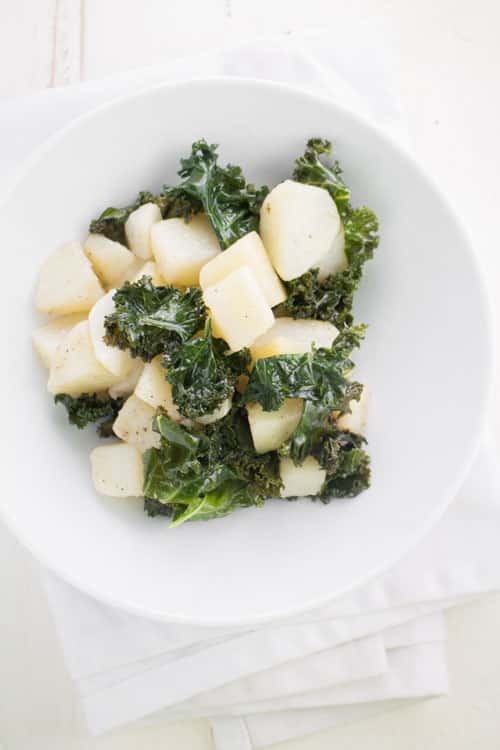 The ingredients are simple: potatoes, kale, and olive oil – that’s it! We have 4 heads of kale growing in the garden right now. They are hearty plants so they can hold up with Winter temperatures and a dusting of snow that might fall on their pretty little heads. Say hello to “Potatoes and Kale”. 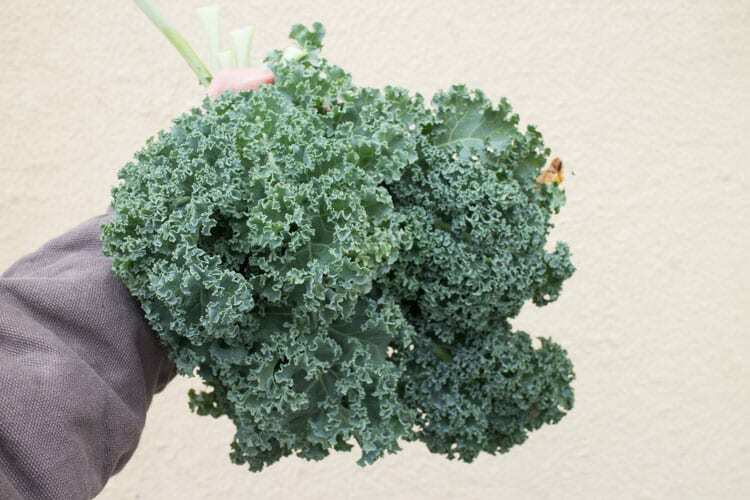 A basic, easy recipe that taught me to respect the kale, love the kale, eat more of the kale. I can’t believe I’m saying this but I’m in love with this simple meal. I super can’t believe I’m saying this but I ask for kale for dinner now. Matthew is all “What should we have for dinner tonight?” and I’m all like “Kale! Kale! Kale!”. This little dish changed my feelings towards kale. 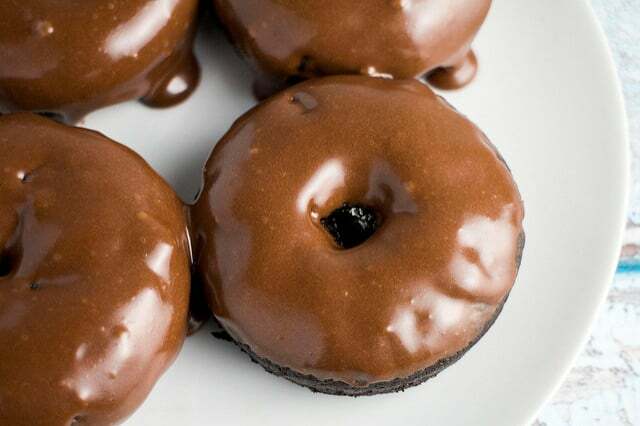 Also I should give credit where it’s due, thank you Matthew, because this is his recipe. He’s the chef behind Potatoes and Kale. After asking this for the 3rd night in a week I got him to write out the recipe which I’m sharing here. The ingredients are simple. Potatoes. Kale. Olive Oil. Salt + Pepper. That’s it. Eat it as a side dish or throw it on a little bed of noodles and call it dinner (that’s what we do). Not only is the meal delicious and easy, but it makes you feel like a all-star afterwards because you just ate a healthy meal and you loved it! Yup, the title is correct. We picked tomatoes in January. It’s crazy! If you live in the Northeast then you probably have witnessed this confusing “Winter” weather. Usually in November you can feel the weather start to change but this year it didn’t hit. Then December came and I thought “Well, now it’s going to feel like Winter”. And on a few days, it did. But the majority of the days did not feel like Winter. Oh Christmas Eve we took a walk, me in short sleeves and Matthew in shorts. It was in the 70’s! ON CHRISTMAS EVE. I have to type that in caps to understand the craziness. December set temperature records across NYC, including Christmas day. Now it’s the beginning of January and I think it’s finally starting to feel like Winter. Winter, are you here? 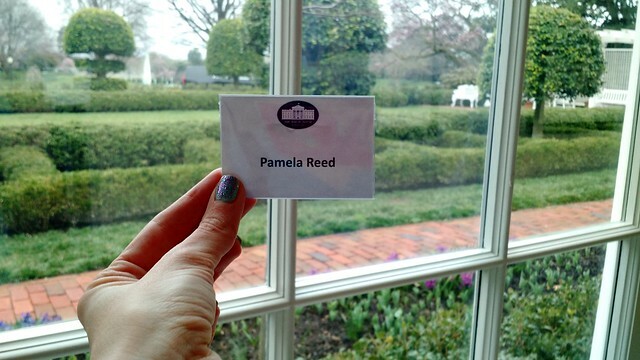 It’s me, Pamela. Snow if you can hear me. Because of the lack of near frost temperatures and our schedule getting busy, this year we didn’t cut down our tomato plants like we usually do at the beginning of November. 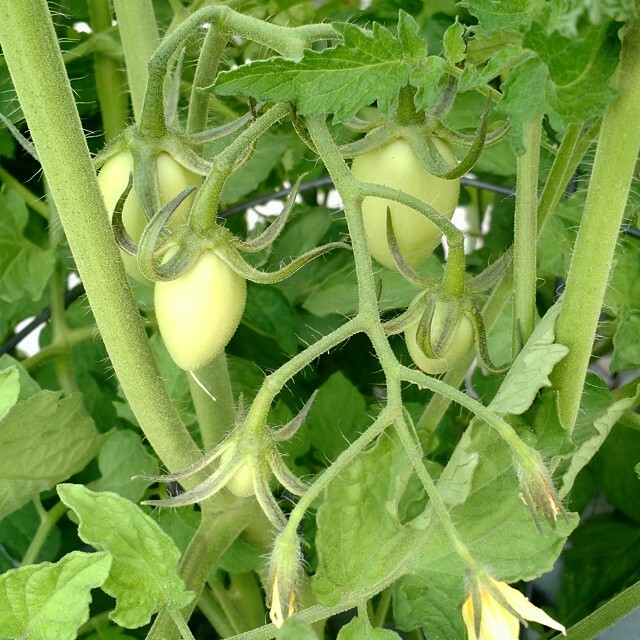 There were still some green tomatoes on the plants and the weather was still changing daily so we left the plants up. 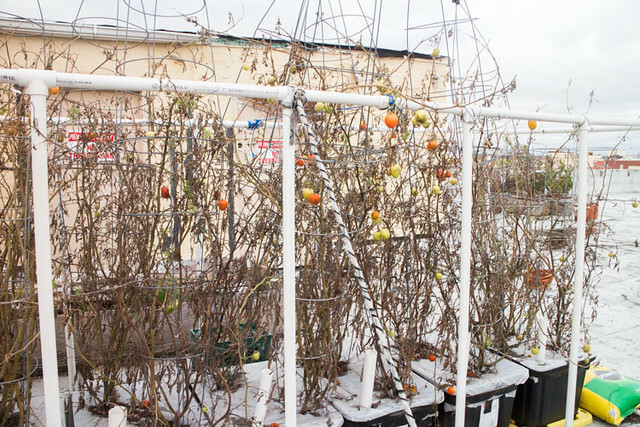 November came, December came, and the tomato plants stayed up. During the Winter we don’t visit the garden everyday so you can imagine my surprise when I checked it out one day and I saw all these tomatoes on the plants! Can you believe it? I thought the plants would be dead by now, but instead they’ve been on the roof making tomatoes! 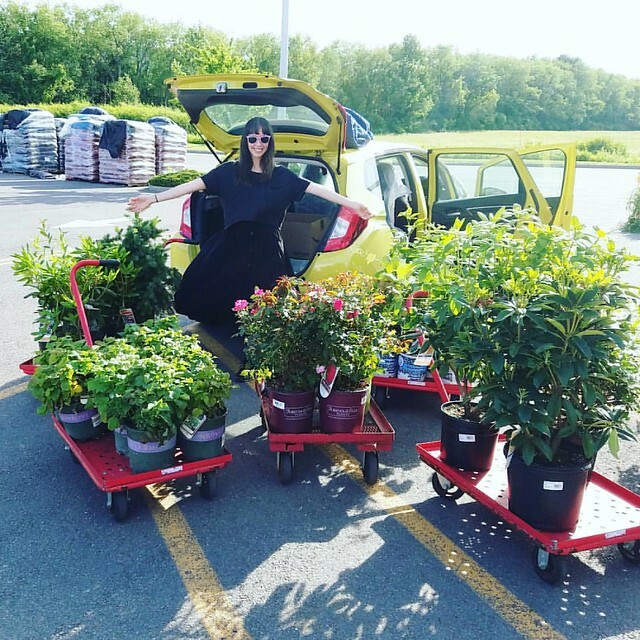 What busy plants…! 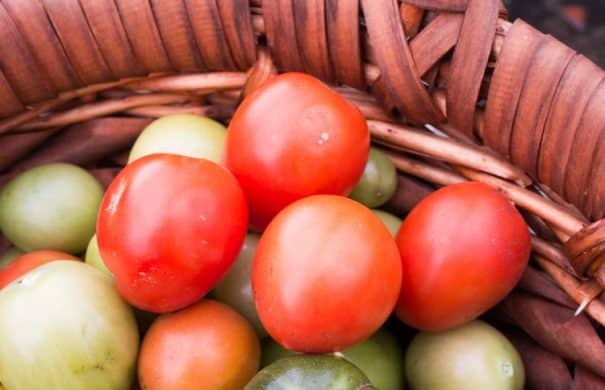 So with it finally feeling like Winter (40 degrees out today) and seeing the upcoming night time temperatures I took a basket to the garden this weekend and picked pounds of tomatoes. I can’t believe we were able to pick tomatoes in the beginning of January! They are! Can't get enough of them! Remember when I said a few weeks ago it was going to frost shortly? Well it didn’t. I’m kicking myself for picking all those green tomatoes but it’s better safe than to be sorry. After all, they are turning red in their shoe boxes beautifully. So with yesterday almost reaching 80 degrees and the previous weekend requiring a Winter hat, it’s a little confusing. I assume this is how the garden feels too, confused. Should I grow? Should I not grow? Should I call for Mom to harvest me? Should I keep Mom away from us because she keeps doing weird dance moves? With a basket in hand I made it to the garden this week to pick some final vegetables of the season. 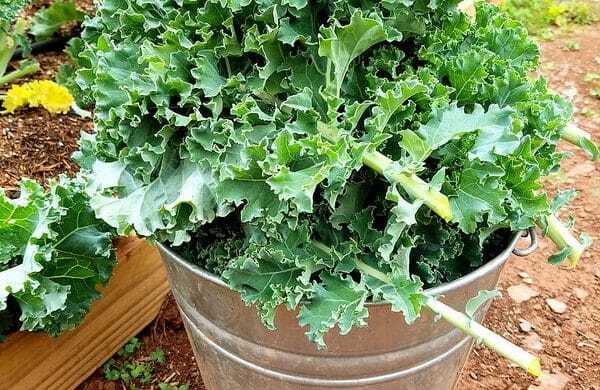 The plants are winding down and I really believe this is it (minus the kale). I picked a nice selection of green beans, peppers (bells and jalapenos), soybeans that I’ll be picking out their pods forever (anyone want to help? 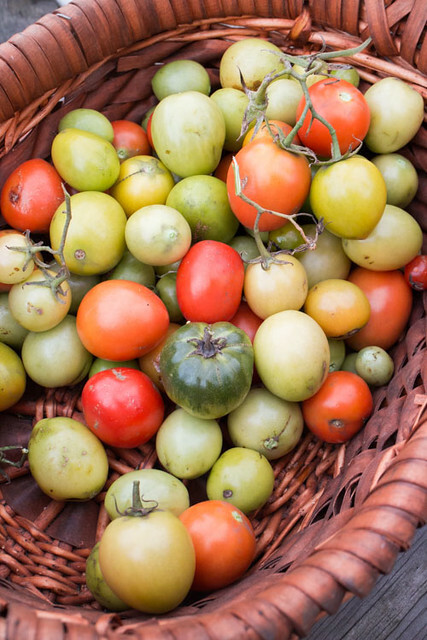 ), tomatillos and the final red tomatoes. 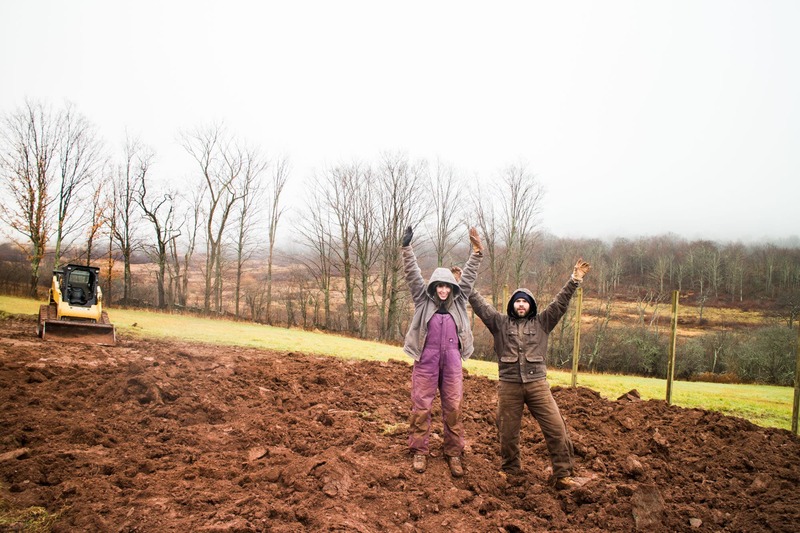 This weekend we’ll start working on a new garden project that’s exciting but you’ll have to wait to hear more about it this month. I can’t wait to get to work on it so I can share it with you! For now though… let’s look at what I picked! A nice selection of veggies..
Green beans for days. I’ve been freezing them so it looks like we have alot of green bean soup ahead of us for the Winter. 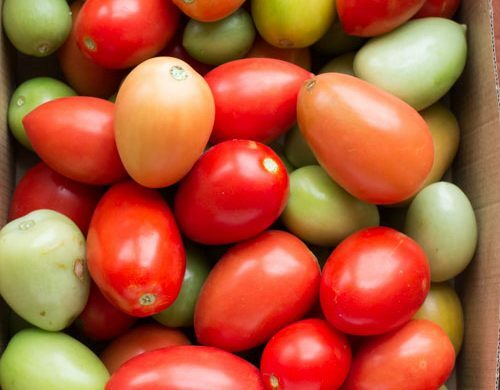 Simple step by step instructions on how to How to Turn Tomatoes Red! All you need is a box! It’s a few days from November but I’m still enjoying fresh tomatoes. No, I’m not picking them from the garden, that ship has sailed. The nights became too cold a few weeks ago and the garden was pretty much put to sleep, minus a few hearty greens. To grab some fresh tomatoes I’m now picking them from a shoebox. To be exact, 4 big shoeboxes full of tomatoes. Don’t you hate when it’s the end of the season and you have hundreds of green tomatoes staring at you? The sadness.. The tears. The longing to want to save all those baby green tomatoes so they can turn into big red adults one day. We had so many green roma and cherry tomatoes left we couldn’t let them go bad. Never leave a tomato behind. We aren’t big fried green tomato fans, so it was back to the basics, time to box up those tomatoes and let them turn red naturally. The way to do is really simple. Are you ready? 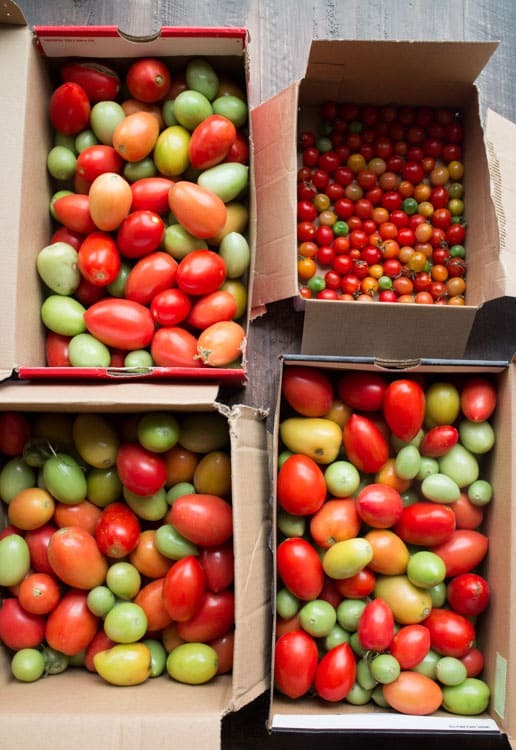 Put your tomatoes in a shoe box (or any type of cardboard box), close it. Put shoe box in cool place. Check on them twice a week. Watch them turn red over time. Pick the red tomatoes out and enjoy! Here’s another tip, if you want to turn them red more quickly then add a banana into each box. Just make sure you keep a eye on the banana so it doesn’t turn into mush and make a mess. With a bunch of green tomatoes left, we stuck them in their boxes about 10 days ago and I just checked them today to find a whole bunch of red beauties looking at me!